For other places with the same name, see Madrid (disambiguation). Madrid is a huge city with several district articles containing sightseeing, restaurant, nightlife and accommodation listings — have a look at each of them. Madrid  is the capital and largest city of Spain, as well as the capital of the autonomous community of the same name (Comunidad de Madrid). The population of the city is roughly 3.3 million with a metro area population of almost 6.5 million. Madrid is best known for its great cultural and artistic heritage, a good example of which is the El Prado Museum. Madrid also boasts some of the liveliest nightlife in the world. Madrid is located just northeast of the geographical center of the Iberian Peninsula, in the middle of the Spanish central Castillian plateau (Meseta central), at an average altitude of 650m. 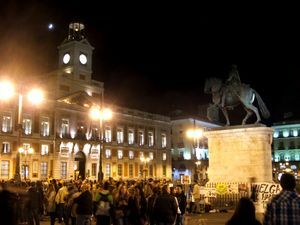 Nearly all of the most famous tourist areas are located in the center of the city including Puerta del Sol, Plaza Mayor, Palacio Real, and Plaza de Colón. The major streets in Madrid include the Gran Via, Alcalá Street, and Paseo de la Castellana. The climate of Madrid is continental; mainly dry and quite extreme at times. Madrid sees perpetual sunshine, a characteristically hot and dry summer, and a fairly cold winter with frequent frosts during the night and the occasional snowfall. Spring and autumn are mild with the most rainfall concentrated in these seasons. Spring and autumn are definitely the best times to visit, especially the months of April, May, June, September and October. There is very little rainfall during summer and also less rainfall during winter. During winter snow occurs sporadically; however, snowfall usually lasts only for a few days, but there is abundant snowfall in the adjacent mountain ranges nearby. 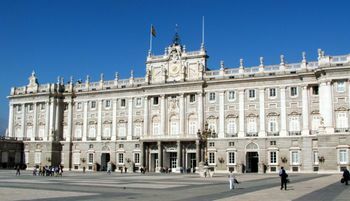 The culture of Madrid is largely influenced by its royal history, as the center of the Spanish Empire. The Royal Palace, big places and buildings used by the Spanish Monarchy, enormous cathedrals and churches are plentiful in Madrid, as well as medieval architecture, although nowadays Madrid is just as much a cosmopolitan city as Berlin or London, full of new architecture, lifestyle and culture. As the Spanish Capital, Madrid has been emblematic of the different "establishments" for most Spaniards. During the 2nd Republic (1931-1936) it was a bustling city of new ideas. Being the capital of the Francoist dictatorship (1939-1975) made the city still seem to represent a conservative part of Spain to many Spaniards. However, the city was also the epicentre of the famous Movida, Spain's 80s movement that bred personalities such as the director Pedro Almodóvar. The heritage of this era is indeed still visible in the city centre, where a party can be found at all times and one of the most liberal and colourful environments of Spain can be seen. The city is also known for its great gay tolerance. The citizens of Madrid, who refer to themselves as Madrileños or the more traditional and currently seldom used term "gatos" (cats), live by a daily routine that is heavily influenced by the climate. Due to the typically midday heat during summer, a "siesta" can be still observed during which some citizens take a break to cool off. Madrileños can usually only afford this "luxury" during holidays and weekends. Most stores are open all day; only smaller stores are often closed during this time. Workers and those more afflicted by Western lifestyles choose not to observe this long break and work traditional business hours, which are usually between 9AM and 6-7PM. During the summer many offices, however, will have a summer schedule requiring workers to start at 8am and finish at 3pm (most commonly without the standard 1-2 hour break for lunch). Offices usually close during the weekend but businesses are often open Saturday morning (downtown stays open until afternoon). Most grocers are closed on Sundays, but some major chain and department stores linked to "culture" (books, music, etc.) will be open throughout the day and all of them on the first Sunday of the month. Shops and department stores in Puerta del Sol area are open every day. Madrid possibly has the largest number of bars per capita of any European city and a very active nightlife; Madrileños are known to stay up until as late as 5AM-7AM. It is quite common to see a crowded Gran Vía on weekend nights. It is important to note that, due to this lifestyle, lodging located near the fun areas may end up a nightmare for light sleepers if your window faces the street. Madrid has a very modernized and elaborate transportation network of buses and Metro. The city contrasts with some large European cities in that it is extremely clean, and city employees in bright yellow vests can almost always be seen cleaning the streets and sidewalks. Like most large cities, however, there is a substantial population of vagrants and beggars lining the streets. Madrid is one of the biggest and most cosmopolitan cities in Europe. Communities of West Africans, North Africans, other Europeans, Chinese, Indians, Filipinos, Pakistanis and (especially) Latin Americans are prominent. Alonso Martínez - Many pubs and small discos. Until about 3AM, a very young crowd, and if you′re around here before midnight, and over the age of 20, prepare to feel positively old. Most places close around 3AM, then people move to nearby areas to continue partying (clubs in Gran Vía or Tribunal). Barrio de las Letras / Huertas - Many of Spain's most famous writers lived there (Cervantes, Quevedo, etc.). It's inbetween Lavapiés, Puerta del Sol and Paseo del Prado. It is an area full of history and interesting buildings and is also well-known because of its concentration of bars, pubs, restaurants and hotels. Plaza de Santa Ana is a beautiful square. It can be considered "too touristic" for some local people. Chueca - Near Malasaña and Gran Vía, it is the gay district (although no one is ever excluded) with a very strong personality. New design, trendy shops, cool cafes. Pop and electronic music. By far, the most cosmopolitan place in town. Has become quite chic and expensive. Tribunal / Malasaña - Hip area. You can enjoy a café, a dinner, a book or just some drinks. Mainly rock and pop music clubs, some of them still open from "La movida madrileña" (a vibrant cultural period from the early 80's). Calle Manuela Malasaña is a great place to eat. So is Calle del Pez although it has mostly bars. Plaza Dos de Mayo is the heart of the district and a great place to have a drink in the open. Conde Duque - Like Malasaña, this district shares a similar audience. Calle Conde Duque is full of cafés and restaurant. Between the main squares in the district, Plaza de Guardias de Corps and Plaza de las Comendadoras, you will also find other options to have drinks, cafés or tapas. The Conde Duque Cultural Centre usually hosts shows, concerts and exhibitions. Gran Vía - The place that never sleeps. Major street that includes many popular nightclubs, usually open from 1AM to 6-7AM. La Latina - Near Lavapiés, it is the place to go for tapas and full of bohemian young people looking for stylish bars. In the old section, many small bars and pubs, a generally older crowd (late 20s, 30s - you know, "adults"). Contains La Cava Baja street. Avoid places in the Plaza Mayor but for sunbathing and beers. Multiple bars serving fantastic tapas in the Cava Baja and Cuchilleros. The area centered on Calle Calatrava (what the locals call 'Chuecatina') is has developed into a gay (but very hetero-friendly) zone. It's surprisingly very crowded on Sunday mornings, from 11AM to late in the afternoon due to its close location to the flea market El Rastro. Lavapiés - Multicultural quarter of the city, with more than 50% foreign residents, mostly from Africa, Asia and Latin America. An increasing amount of westerners are choosing Lavapies as their residence in Madrid, mainly because of the hip vibe it has attained in recent years. Plenty of world music bars and many alternative theaters and art galleries. Lavapiés is maybe the most cosmopolitan and hippy area at the same time in Madrid. Indian restaurants, alternative cafés, African music and South American shops. Several community gardens, food co-ops and eco shops are scattered around the district. Not a lot of tourists here since the quarter holds no monumental sights but has a rather a unique atmosphere. Walking around for a beer or a coffee is well worth it. Moncloa - Due to its proximity to the main University in Madrid (Universidad Complutense), Moncloa is associated with students and a student lifestyle, many cheap bars and discos as it is near the university, although some of the places are best avoided. Salamanca - Plenty of expensive boutiques, unique shops with impossible prices and department stores. Torre Europa. There used to be several posh pubs and clubs under the tower across from the stadium. There are 4 or 5 bars and discos in the avenida de Brazil area catering to a young and student crowd. Ciudad Universitaria. This area is where most of the students reside as there are several dorms in this area. There are many, many cheap bars with great nightlife starting from Thursdays. Adolfo Suárez Madrid-Barajas Airport (IATA: MAD), +34 902 404 704,  is located 13km from the city center. It is one of the largest airports in Europe and is serviced by many airlines, as well as being the homebase for Iberia Airlines. The airport has 4 terminals. Terminals 1, 2 and 3 are close together and serviced by the same metro station, while Terminal 4 is far from those and has its own metro and commuter train stations. The best way to move downtown is taking the Metro (line 8 pink, from 06:30 to 01:30, to/from the airport €7.50) to Nuevos Ministerios station from all terminals. It is clean, safe, frequent, fast and inexpensive. The airport is located within the city limits of Madrid and it is just 9 km (6 mi) from the city's financial district. The airport has two metro stations depending on the terminal. Travel time is 25 minutes. In order to reach the city centre (Sol, Ópera or Gran Vía), or other stations consult the metro map. Terminal 4 of the airport, additionally to the metro network, is also connected to the city by Cercanias commuter train (line C-1, from 06:00 to 22:30, €3.10) which goes directly to Atocha and Chamartin mainline train stations. To connect to Sol, take the train (look for Renfe Cercanias) to "Nuevos Ministerios" and then transfer to line C-3 or C-4 southbound on platform 8; Sol will be the first stop. If you are connecting to a long distance or AVE train at Atocha or Chamartin, then your Cercanias (C-1, and any connecting C trains) ticket is free. You will still need to get the actual Cercanias ticket. Ask at the RENFE kiosk at Barajas Terminal 4 directly across from the automatic machines where most people purchase their C-1 ticket (just before you reach the C-1 turnstiles). Show your ticket to the attendant and they'll issue your free Cercanias ticket. Other way of reaching downtown is a 24-hours express bus service that passes all terminals and then goes direct to O'Donell, Cibeles (20 minutes walk or quick metro ride to Puerta del Sol) and Atocha (main train station, not serviced between 11:30 PM and 6 AM). 5 euros, paid in cash to the bus driver. Departures every 12 minutes (daytime) to 35 minutes (late at night). Travel time Terminal 4 (end of line) - Cibeles 30-40 minutes. Public bus nr. 200 operates between the airport and Avenida de América bus station in Madrid. It is only 1.50€ and you can use your weekly ticket or 10-trips ticket. Bus 114 does NOT go to the airport terminals and is a 40-minute walk to Terminal 1. Public night bus N4 goes from Plaza Cibeles to Barajas district, 400m walk from the terminal through a passageway over the highway. Best to get off at the second-last stop, Avenida General, and then make a right turn immediately after the bus stop. Go straight on, keep going straight crossing the parking lot, and then you make a left to cross another huge parking lot. After that you see the road and the pedestrian highway overpass. Only 1.50 Euros or the 10-trip ticket is valid as well. From the Airport it is also possible to take a taxi. Journeys between the airport and the inner M30 area (city center), or vice versa, including those reserved electronically, are subject to a flat rate of 30€. Renfe, +34 902-240-202,  operates train service to/from Madrid. Frequent trains operate between Madrid and Barcelona (2h 40min), Seville (2h 20 min), Malaga (2h 30 min), Zaragoza, Tarragona, Lerida, Huesca, Ciudad Real, Puertollano, Lisbon, Milan, the French coast, Paris, with continuing journeys to most of Europe. Madrid has two train stations: Chamartín and Atocha, both of which have excellent Metro and Cercanias commuter train connections. Most northbound and international trains arrive and depart from Chamartín station, while trains to Barcelona, Valencia and southern Spain depart from Atocha. If you need to get between the two stations, Metro line 1 (€1.50, 30-40 minutes) or Cercanias lines C3 and C4 (€1.35, 15 minutes) offer the most direct connection. Chamartín station is on the north side of the city and is served by the Metro stop of the same name on Metro lines 1 and 10. Atocha is on the southern side of the city center and is divided into two main sections, an area for Cercanias trains and one for long-distance trains. The long-distance side is set inside the towering old station, where you will find a tropical garden with a pond full of small turtles as well as a number of shops. A memorial to the victims of the terrorist attack of March 11, 2004 is in the Cercanias portion of the station near the Metro stop. Madrid has eight enormous international and intercity bus stations. Information on where buses to a particular destination depart from can be found at the Tourist Office. Many of the international buses, and those headed south of Madrid, arrive at and depart from Estación Sur de Autobuses (Calle de Méndez Álvaro, Tel:+34 91-468-4200 ) which is accessible by metro. Buses to and from Barcelona and Bilbao operate from the Avenida de América bus terminal, also accessible by Metro. There are car rental facilities available at the airport, train stations, and other main travel sites. Always be sure to have a street map handy! The roads within Madrid are difficult to navigate as there are no places to stop and consult a map or check your route. Also, if you are relying on GPS navigation, be aware that there are several consecutive junctions underground near the centre and your GPS may not get a signal underground. Plan your turns before you enter the tunnels. Madrid city is well covered by the main global car rental companies, such as Avis, Budget,Hertz, Thrifty & Europcar, some of these also provide Rent to Buy Facilities. All car rental companies offer competitive pricing for economy class vehicles and unlimited mileage options. Some local car rental companies may also offer competitive pricing. Parking within the city follows the pay-and-display system, daily from 9am to 9pm (limited on Saturdays, and all August, to 9am to 15pm, and being free on Sundays). Madrid proudly sports one of the best public transportation networks in the world and the second largest metro network in Europe, second only to London's. Buses and subways form an integrated network  and work with the same tickets. A single ticket costs €1.50 (5 stations) – €2.00, a ten trip ticket costs €12.20 / €18.30. Alternatively, you can buy unlimited travel passes as follows: 1 day (€8), 2 days (€13.40), 3 days (€17.40), 5 days (€25.50), or 7 days (€33.40). Children under the age of 4 may travel without a ticket. Children under 11 receive a 50% discount. Tickets can be purchased at Metro stations, news-stands, and estancos (tobacconists'). The Metro de Madrid  (Madrid's Subway/Underground) is one of the better and less expensive metros in Europe. It is an underground railway network that covers practically the entire metropolitan area and airport. In addition, the underground tunnels of the Metro provide relief from the sun on hot days. Ticket machines are multilingual with instructions in Spanish, English, French, and German. The TOURIST CARD is the most practical ticket for visitors, valid for all the public transportation system (metro + buses + trains) for 1, 2, 3, 5 or 7 calendar days and 2 zones: A and T. Prices depend upon the selection and validity, but as an example, zone A (that includes almost the entire city and airport) for 7 days currently costs 35,40 €. It is an electronic contactless card and can be purchased from ticket machines at all Metro stations, including the airport. Credit cards are accepted, but if your card doesn’t work even with a PIN, the airport metro has a counter which sells this card and has a credit card terminal. When you travel to or from airport stations, there is additional supplement of €3, which can be paid at the entrance or exit. The Passes or Tourist Card do not require this supplement-it is included in the price. You can catch some trains as late as 2:00AM, although the official close time for the metro system is at 1:30AM. Announcements in the metro are made in both Spanish and English on most major lines, including the line to and from the airport. Along with this, almost all metro stops have a map of the exits and the surrounding area above the station. However, most stations don't have a map of the Metro lines on the platform so prepare for your travel in advance and don't expect to plan your journey on the go. Whatever the Metro doesn't cover, the buses do. Night buses (Búhos, "night owls"), have their main hub at Plaza de Cibeles , covering most of the city at roughly 20-minute intervals. Buses are equipped with free wi-fi facility (EMTmadrid), easy to use with any type of laptop or netbook. Madrid has a system of local trains (Cercanías) that connect outlying suburbs and villages with the city center. Although most useful for visiting historic or outdoor destinations outside the city core, they are also useful for quickly getting from the north end of the city (Chamartin and Nuevos Ministerios) to the south end of the city (Sol and Atocha) and, as of Sept 2011, Barajas airport (terminal 4). Taxis can be hard to find during late hours on weekends, especially if there is some rain. Unlike in other European cities, there are few taxi stands; just stand by the side of a major road or bus stop and wave your hand to signal an available taxi passing by. Available taxis have a green libre sign in the windshield and a green light on top. Official taxis are white, and have a red stripe and the flag of Madrid on the front door. The tariff is displayed on top of the car (a 1 during daytime, a 2 during the night, which become 2 and 3 on holidays such as Christmas Eve). There are also special surcharges for entering or leaving the airport/train station. Ask for the written table of tariffs and charges (suplementos) (shown on small stickers on rear windows, compulsory by law) before paying if you think it's too expensive. Be aware there are some taxi drivers that will do what is called 'la vuelta al ruedo' which basically means they will drive you around or through the crowded avenues to increase the fare. Most taxi drivers do not speak English, so you should have the names and/or addresses of your destinations written in Spanish to show your taxi driver. Likewise, get your hotel's business card in case you get lost. Transportation by private automobile in Madrid can be a nightmare. The Spanish capital suffers from the typical problems of most big cities; far too many cars and not enough space to accommodate them. Sometimes there can even be traffic jams in the Paseo de la Castellana at 3:00 AM (early to some Madrileños). The problem is compounded by the narrow streets in the old town, where a lorry delivering beer barrels to a local bar can cause a huge tailback. Finding a parking space can be very time consuming, and difficult if one is not skilled in the art of close proximity parallel parking. Many Spaniards are also lacking in this art, prompting them to simply park in the street, blocking other cars in. If you find yourself blocked in by such a practice, honk your horn until the driver returns. If you parallel park your car in Madrid, be aware that most Madrileños park by sound alone. They will feel no remorse for repeatedly hitting the car in front and behind them while trying to get into or out of a tight spot. If you value your car's paint job, or you have rented a car, it may be best to park underground. Though this is no guarantee for nobody hitting your car, the chances are somewhat diminished. In short, renting a car is not only unnecessary, but not recommended for getting around downtown Madrid, and a car is likely to be more of a liability than an asset. Visitors should make use of Madrid's excellent public transportation instead. Renting a car only makes sense if you are planning to leave Madrid and drive to the nearby towns. Although Madrid does not appear as a bike-friendly city at a first sight, things are changing slowly to make bike experience more comfortable. Several streets in historical downtown have been transformed into mixed-traffic spaces where pedestrians and bikes have priority over cars. There are new easy-bike paths all along the river and connecting important parks. To avoid some of Madrid inconveniencies, such as hot weather or slopy streets it is also possible to get bikes on Metro and Railways trains with some schedule restrictions, and on every public transport without restrictions when using folding-bikes. There is a public rent-a-bike service,BiciMAD. There are also some rent shops on historical center area such as the company Baja Bikes and Urban Biking . These companies offers several rental points in Madrid (Retiro, Atocha, Madrid-Río, etc.). They offer Guided and self-guided bicycle tours, using electric or conventional bicycles. The Madrid City Tour Hop on/ Hop off Buses cost EUR 21 for 1 day and EUR 25 for two days (adults). For families with 2 adults and 2 kids, it costs EUR 53 for 1 day. 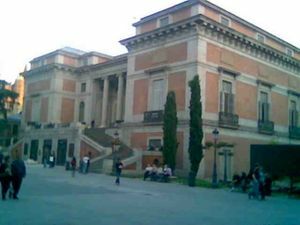 Stops on Route 1 include Museo Del Prado, Puerta De Alcala, Barrio De Salamanca, Plaza De Colon, Plaza De Cibeles, Gran Via 14, Gran Via 30, Gran Via 54, Plaza De Espana, Templo De Debod, Teatro Real, Palacio Real, Puerta De Toledo, San Francisco El Grande, Cathedral De La Almudena, Plaza Mayor, Puerta Del Sol, Circulo De Bellas Artes, Museo Thyssen, Museo Reina Sofia, Jardin Botanico, Museo Del Prado. Stops on Route 2 include Plaza De Neptuno, Plaza De Cibeles, Plaza De Colon, Museo De Esculturas, Museo De Ciencias Naturales, Nuevos Ministerios, Santiago Bernabeu, Consejo Superior Investigaciones Cientificas, Museo Lazaro Galdiano, Serrano 61, Serrano 66, Museo Arqueologico, Puerta De Alcala, Alcala 19, Puerta Del Sol, Plaza De Las Cortes, Plaza De Neptuno. Madrid is relatively flat, it's great to easily move by bicycle, skateboard, rollerblades or book a segway tour in Madrid or rent one and move through the city without walking. It's secure and if you would like to know more about the different sights, what to do, where to eat or hang out you should go with a guide. While knowledge of the English language is increasing among the younger generations, the majority of Madrid's residents know only a few words - even employees at American businesses such as McDonald's, KFC or Burger King and employees at cash exchange centers rarely speak much English. You can often find someone with a fair grasp of English at larger hotels and tourism sites, but it would nevertheless be helpful to know at least a few common Spanish words and phrases. 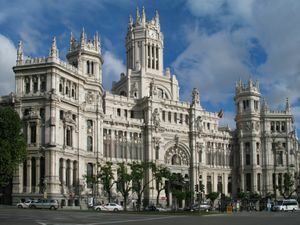 This is Madrid's museum district, named for the three major art museums clustered along Paseo del Prado east of the old city: the Museo del Prado, one of the finest art museums in the world, the Thyssen-Bornemisza, a baron's collection of classical art, and the Reina Sofia, Madrid's modern art museum. However, a couple of smaller museums also occupy the neighborhood which are well worth seeing as well. Its important to note that many of the museums offer free entry during certain times most days. It varies by museum and day, but to if you are looking to take advantage of these beautiful muesums with a lesser budget, it is still possible, if you’re willing to queue. For example, the Prado sometimes has queues of over 200 meters with several hundred people, yet one could stroll into the Thyssen on Monday at 1pm. Art galleries (which display and sell art) can mostly be found via the "Asociación de Galerías de Arte" (de Madrid); they have a great map of all associated galleries that will lead you to a great variety of places to discover great art, established or upcoming. Most galleries will also be able and willing to provide you the map in paper form. Many of these galleries are located in the Barrios de Lavapiés, las Letras, Salamanca, Las Salesas (upper part of Chueca Neighborhood), while you may find some treasures elsewhere, too. For the neighbourhoods with more galleries, just wander around the neighbourhoods, step in in some of them and "get lost in art". In some neighbourhoods you may need to ring a bell to have the personell open the door, feel free to do that, you are most generally really welcome. Please also note the Art Gallery Tour guiding you through such great places (see next bullet). Art Gallery Tour is a pioneer initiative that brings people closer to the world of contemporary art through guided tours of the best and most important galleries & exhibitions in Madrid situated in magnificent spaces in the three most historic districts of Madrid: Salesas, Letters, Salamanca and Dr. Fourquet St. It is a great opportunity to discover Madrid & its cultural heritage. Their main goal is to democratize art in Spain, raising awareness of contemporary art and stimulating the art market. 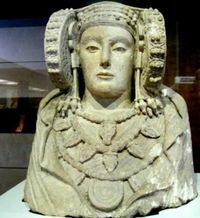 For more information visit: http://www.artgallerytour.es. Chilean abstract artist Gastón Covarrubias runs a laundry in Calle Buenavista, 44, Lavapies. A unique experience where you can get your clothes washed while learning about abstract art and hear Gastón´s stories about his early life in Chile painting abstract art on rocks with the blood of fish. There are a number of free, English language periodicals that you will find in bars and restaurants that are a great source of event information. PopGuide Madrid  is Madrid's premier English and German lifestyle magazine and features the best Madrid has to offer and the latest in film, fashion, music and art. The monthly InMadrid newspaper  has a number of articles and information about events around town. Aimed at the 20-35-year-old crowd, European Vibe  has listings for concerts, exhibitions, bars, restaurants, parties and other events happening in Madrid as well as articles about living in the city. In NocheMAD  you will also find a very extensive agenda with concerts, parties and theatre plays in Madrid. Check the websites for current distribution points. Four teams from Madrid play in La Liga (Spain's premier division). The matches between Real Madrid and Atlético de Madrid are known as "El Derbi Madrileño" (English: Madrid Derby). There are two major teams, Estudiantes and Real Madrid. There are also a few movie theathers in Madrid where they show the orignial version of the movies subtitled in their original language. The list is provided below. La Transhumancia. Annual event during which the center of Madrid is free of cars and is instead filled with shepherds exercising their ancient right to drive sheep and livestock through the city. If you want to go to Madrid to learn Spanish, there are several private language schools that offer Spanish courses for foreigners. Another option is to take a Spanish course at university, the Complutense University of Madrid offers Spanish courses for foreigners that take place in the faculty of Philology and Letters . La Aventura Española, C/ Montesa,35 (dcha)2º dcha, ☎ +34 912 196 991 ([email protected]), . edit Learn Spanish while having fun in Madrid. La Aventura Española is an Instituto Cervantes accredited school that offers a wide range of Spanish courses for all needs and all levels. Major credit cards and foreign bank cards are accepted in most stores, but be aware that it is common practice to be asked for photo-ID ("D.N.I."). If asked for your DNI present your passport, residency permit or foreign ID card. Basically anything with your photo and name on it will be accepted by most shopkeepers. The signatures on credit cards are usually not checked. In addition to the shopping areas below, there are also a great number of H&M, Zara, Mango, and Blanco stores all over Madrid, with high fashion clothes and accessories at a low price. Sol-Salamanca districts. The most convenient area for tourists is around Calle de Preciados, between Sol and Gran Vía, home to the El Corte Inglés department store, high-street names like Zara, Gran Vía 32, H&M, Sephora, Pimkie. The smartest shopping district is Salamanca northeast of the center, around Calle Serrano. Top designer names like Chanel, Versace, Hermès, Hugo Boss, Louis Vuitton, Giorgio Armani, Dolce e Gabbana and Hugo Boss, including the fluid fabrics and elegant cuts of Spanish designer Adolfo Domínguez, are located on Calle Ortega y Gasset. Head for Calle Serrano for Purificación García, Roberto Verino, Ermenegildo Zegna, Loewe, Carolina Herrera, Manolo Blanik, Cartier, and Yves Saint Laurent. Prada is on Goya street, and on Jorge Juan St you can find even more luxury shops. Chueca and Fuencarral Street Area— This part of the city used to be an abandoned and marginal area. 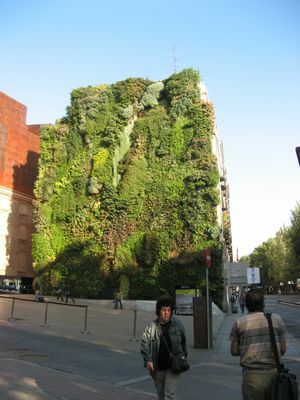 However recently, it has quickly turned into the most avant-garde and modern part of Madrid. 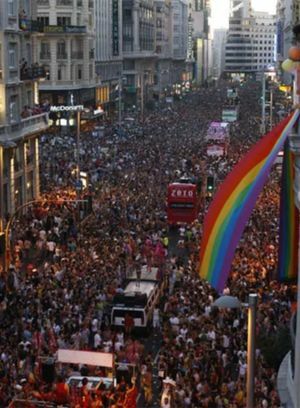 Thanks to the gay community, old shops were taken over and turned into the coolest places of Madrid. Today it is an example of modernity, a paradise for entertainment where everything is possible. The streets are filled with restaurants, alternative cafés and shops, a good example is the Market of Fuencarral (Mercado de Fuencarral, in Spanish) a novel shopping center concept. Apart from the purely commercial, this area proposes a wide range of gastronomy and party clubs by night in the weekends. Calle Toledo, south of Plaza Mayor— A number of traditional shops selling Spanish rope soled shoes (espadrilles or alpargatas), jute products, and leather can be found here. Dishes popular throughout Spain are also widely served in Madrid. Gallinejas and Entresijos - Portions from different parts of lamb fried in its fat. Very traditional and typical from Madrid city. Callos a la Madrileña - A hot pot of spicy beef tripe similar to those found in Turkey and the Balkans. Cocido Madrileño - Chickpea stew with meat and vegetables. The particularity of this stew is the way it is served. The soup, chickpeas and meat are served and eaten separately. Oreja de Cerdo - Pigs ears, fried in garlic. This popular dish is widely eaten throughout central Spain. Sopa de Ajo - Garlic soup is a rich and oily soup which generally includes paprika, grated Spanish ham, fried bread and a poached egg. A variation of this soup is known as Sopa Castellana. It is ironic that Madrid, located right in the centre of Spain has higher quality seafood than most coastal regions. This quality comes at a price, and most Spaniards only occasionally shell out for a mariscada (Spanish for "seafood feast"). Experiencing Madrid's seafood may be, for the visitor, an experience which will be worth the cost. Meat and meat products (Jamon Iberico, morcilla, chorizo etc) are of generally a very high quality in Spain and particularly in Madrid. Many of the restaurants and cervecerías in the Sol and Plaza Mayor area have "generic" poster board advertisements on the sidewalks with pictures advertising various paella dishes. These paellas are usually of bad quality and should be avoided. If you are looking for good, authentic Spanish paella, it is usually best to find a more expensive, "sit-down" type of restaurant that offers a variety of paella dishes. A much better option is the La Latina neighborhood just south of Plaza Mayor, especially along the Cava Baja street. To enjoy a gastronomic tour of this area you can join the Old Madrid Tapas & Wine Tour . There are also a number of deli-like shops along Calle Arenal that offer food para llevar (for take away). At bars, one generally orders various sized plates, a ración meaning a full dish, a media ración a half dish or a smaller version which would be a tapa, a pinxto or a pincho. The Spaniards don't eat lunch until 2 or 3 pm, and dinner doesn't start until 9 or 10 pm. As a rule of thumb, restaurants serve lunch from 1PM (earlier in touristic zones) until 3:30PM, then close and re-open for dinner at 8:00PM, serving until 11:00PM. This schedule is usually for restaurants since bars and "mesones" are usually opened all day long offering a wide variety of "tapas" and "bocadillos"(rolls) for a cheap price. If you're really desperate, the standard bunch of fast food chains do stay open throughout the day. Kabuki, "av., . Mon-Fri 13:30-16:30 20:30-23:30 Sat 13:30-16:30. edit Japanese-iberian cuisine. Chef and part of the staff regularly spend months in Japan perfecting their technique. Most critics agree they offer the best sushi in Europe. In the tapas bars, you should get free food with your drinks. Nightlife starts later in Madrid, with most people heading to the bars at 10-11PM. El Rincón de Fogg. Calle Juan de Urbieta 12. (Metro: Pacífico). Open daily from 07:00 to 22:00 and Friday and Saturday till 00:00. You can have 2 litres of sangría in a self service dispenser from just €14, or €13 for 2 litres of beer, and you get a free plate of patatas bravas. They also have a delicious selection of bocatas from €2,45. Big TV to watch the football matches while enjoying eating and drinking. If you say you've read this, they'll invite you to a glass of rosado wine. Dubliners, Espoz y Mina, 7 (Metro: Sol), An Irish bar in the centre of Madrid near Puerta del Sol. The bar has televisions and is one of the places where sport can be seen. Clubs generally open at about midnight. If you go in any earlier you may find it quite empty. Many clubs don't close until 6AM, and even then everyone is still full of life. Only You Hotel & Lounge, Calle Barquillo 21, 28004, Madrid, Spain. In the Chueca neighborhood, just north of Calle de Alcala and West of Paseo de Recoletos. +34 91 005 222. From €110. Brand new boutique design hotel in 2013. Lounge & bar with DJ entertainment. When travelling in Spain is not easy getting connected, Internet pre-paid cards can be purchased but with few formalities. Wi-Fi points in bars and cafeterias in Madrid are available after ordering, and most Hotels offer Wi-Fi connection in common areas for their guests. Madrid buses also have wi-fi connections although the speed can vary. "Locutorios" (Call Shops) are widely spread in Madrid near touristy locations. In Madrid do it's very easy to find one. Making calls from "Locutorios" tend to be much cheaper, especially international calls (usually made through VoIP). They are usually a good pick for calling home. Madrid is a relatively safe city. The police are visible, and the city is equipped with cameras. There are always a lot of people in the streets, even at night time, so you can walk across the city generally without fear. Travelers who remain aware of their surroundings, and keep an eye on their belongings should have little to worry about. Madrid has a significant amount of nonviolent pickpocket crime, so always watch any bags you have with you, especially on the Metro and in busier public spaces. It is important for your safety to avoid falling asleep in the metro, which can leave you particularly vulnerable to thefts. It is not unknown for thieves to cut jean trouser pockets in order to steal belongings. Be careful when carrying luggage, especially if anyone approaches you with an outspread map in hand asking for directions. This may very possibly be a trap to distract you while an accomplice steals your luggage. When using ATM machines, be aware of your surroundings, just as you would anywhere. Bring a friend if you need to withdraw cash after dark. If someone approaches you while using an ATM, simply hit CANCELAR, retrieve your card and move on. Beware of thieves preying on people leaving night clubs who have had a lot to drink. Do NOT carry valuables on a night out. Some pickpockets in busy areas at night will try to distract you with pointless questions and noises. Be firm with them and don't let them touch you, especially if they try to hook their leg over yours and play it off as nonsense. This is a technique to catch you off guard and go for your pockets. Beware of anyone who approaches you and asks you to write down your signature: it is normally for a "sick hospital" unit, and she will point out the "stamp" on the paper. She will then ask for a generous donation of €20 or more. This distraction can often be used to block vision while a pickpocketing or theft attempt is made. Be aware of young men and boys who are indicating they are deaf/homeless trying to get you to sign a piece of paper. This also can be a ruse to distract you in order to steal your belongings. These thieves sometimes enter cafes/bars so make sure you do not leave wallets/phones on the table as possessions on show make for easy targets. The area around Calle de las Infantes near Gran Via is particularly renowned for this. Avoid people offering masaje (massages). Be firm and say "No me toques" (Don't touch me) or "No tengo dinero" (I don't have any money) and keep walking. This is often a scam to extort money. Coffee shops such as Starbucks are typically full of locals and tourists playing with mobile phones, laptops and tablets. Groups of gypsy kids are often seen raiding such establishments - they favor branches with two exits and run from one to the other, grabbing whatever they can. Keep your wits about you and keep hold of your things if something doesn't feel right. Street drinking (Botellón) is a very popular and cheap night out. However, be careful as drinking in the street is against the law and the police can and will fine you. Alcalá de Henares — A UNESCO World Heritage site. Alcalá de Henares was the world's first planned university city. It was the original model for the Civitas Dei (City of God), the ideal urban community. This city has a lot of interesting places to visit like its university founded in 1499 which became famous as a centre of learning during the Renaissance. One of the most important features of Alcalá de Henares is that it is the city where the famous writer of Don Quixote, Miguel de Cervantes, was born where you can visit his natal house. Aranjuez — A UNESCO World Heritage site. Aranjuez is an excellent day trip away from Madrid. Highlights include the Palacio Real, the summer home for the Bourbons and the lavishly designed Casa del Labrador near the Tagus River. There are some excellent restaurants serving the local specialty, asparagus. To get there, catch a local train (Cercanía C-3, direction Aranjuez) from either the Atocha or Chamartin stations. It takes around 45 minutes from Atocha station, or around 55 minutes from Chamartin station. Ávila — A UNESCO World Heritage site, with its city center surrounded by the Walls of Avila, the most complete fortification in Spain from the 11th century. An hour and a half away by train, from Chamartin station. Chinchon — A typical Spanish town that retains its character from the 1700s. El Escorial — A UNESCO World Heritage site. A mountainous retreat home to Spain's largest monastery, the Royal Monastery of San Lorenzo de El Escorial. To get there, catch a local train from either the Atocha or Chamartin stations. It is just over one hour from Atocha station or around 55 minutes from Chamartin station. Segovia — A UNESCO World Heritage site. Medieval city home to a famous Roman aqueduct and the Spanish Mint (It doesn't belong to Madrid region, but it's quite close and worth a visit). It is about a 2 hour train ride from Atocha station or 1 hour and 45 minutes from Chamartin station on the regional trains, or as fast as 30 minutes on the high speed trains. Toledo — A UNESCO World Heritage site. Medieval walled city and former capital of Spain. It's about a 30 minute train ride from Madrid Atocha station, with plenty of art (del Greco) and architecture (one of the best cathedrals in Europe) so very worthy of a day trip but more worthy of a night. But it is on the late spring and the early summer nights that it reaches its beauty peak, simply breathtaking, do not miss it. A word of warning, Toledo is on every ones itinerary from Madrid nowadays and has been spoiled somewhat by rampant commercialism and exploitation of tourists. The sites to see no longer come cheap. Valle de los Caídos — The memorial to all soldiers killed during the Spanish Civil War, it is the world's largest free-standing Christian cross and houses Franco′s tomb. The construction was ordered by Franco and carved from the rocks through the labor of Republican prisoners of war. El Pardo — A little village near Madrid (8 km. from the city center, connected by bus) and close to the Palacio de la Zarzuela (residence of the King of Spain, no visits allowed), surrounded by mountains and the location of the Palacio de El Pardo (El Pardo Palace), Franco′s residence between 1940 until his death in 1975 and a former residence of the Kings of Spain. Sierra de Guadarrama — A mountainous area north-east of Madrid probably reached most easily by Renfe Cercanias to Cercedilla on the line to Segovia. There is a special Renfe Cercanias line, narrow gauge and often single track, from Cercedilla through glorious scenery to Los Cotos. This is only yards from an entrance to the Peñalara Nature Park. This page was last edited on 16 March 2019, at 06:56.